What a nice picture. 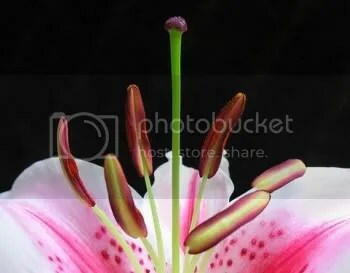 I love that it captured the center of the flower so well. Thanks for the share. My WW is up. Now that is just beautiful. No two ways about it! Thanks everybody. I thought a lilly would be perfect right about now. If you haven’t already done so, you should check out the photographer’s other work. It is absolutely wonderful. That sure beats my WW. Beautiful! My WW is up. Love the flower photo, did you take it yourself? It is beautiful! EmilyRose Jewel, It was actually taken by a Flickr artist that I stumbled accross this week. I’ve linked to his site. Please, feel free to swing over and let him know haw amazingly talented he is. Thank you, PJ. That means a lot to me. Nothing man-made could ever compete with nature. So beautiful!! As you know, I’m quite partial to flowers! 😉 Stargazers are one of my favorites! WOW! That made me gaze in awe. I love the pic!! it’s lovely!! happy WW, mine is up!! great pic once again!